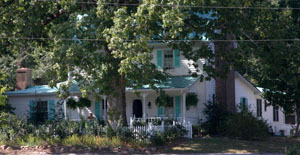 The 2007 annual home tour included the "Teacherage" (home of Dan and Kathy Martin), a restored 1850 farmhouse (home of Marcie and Craig Corry), a contemporary house (home of Bobby and Rosalyn Cox), a log cabin at the Bobby Cox house, the 1914 Union Train Depot (home base for the Apex Chamber of Commerce) and the Maynard-Pearson House (home of the AHS). The 1870's farmhouse has changed little since its last remodeling in 1944. In fact a 1990 photo shows the original porch across the front and rooms in the rear just as it looks today. 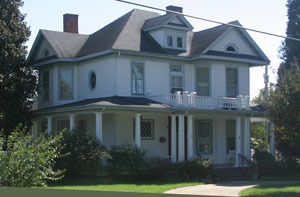 Built by James Jackson Maynard and his wife Civil D. Pearson, the house remained in the Maynard-Pearson family until 1994 when the farm was sold to MJK Development, which later deeded the house to the Maynard-Pearson House Trust under the Apex Historical Society umbrella. 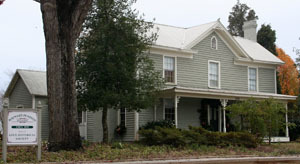 The last Pearson family members to live in the house were Dr. Paul Lamar Pearson, his wife Hazel and daughter Lamar. Dr. Pearson was a local Apex dentist and his office was in another old farmhouse still standing just two doors away from the Maynard-Pearson House. After his death the house was left to Dr. John Kent Pearson, an Apex medical doctor, and it became a rental house until he sold it with a portion of the original farm for development in 1994. Generous support from the community and AHS members and countless hours of hard work have made the house into what it is today: a museum of rural living offering educational tours for adults and children alike. Not only is the M-P house a prime example of restoration and preservation, it is a showcase for period furnishings donated from the estates of many outstanding Apex citizens. This impressive two-story Queen Anne dwelling was built on a large corner lot around 1905 for merchant L. J. Sears, who boarded teachers working at the nearby Apex District School (now Apex Elementary). The house is richly detailed with a pyramidal roof, a wraparound porch supported by Doric columns with a turned balustrade, and a variety of decorative windows. Most of the rooms inside the house were constructed with bay areas containing large windows for plenty of light. There are four remaining fireplaces in the downstairs area of the house, each uniquely designed, one of which is framed with tiger oak and is enclosed with beautiful leaded glass doors. The original wainscoting and much of the original plaster gives way to ten and one half foot ceilings throughout the home. After the home was no longer used as a teacherage, it fell into disrepair until the late 1970’s when Cloy and Shirley Wells purchased and renovated it. In 2006 Dan and Cathy Martin purchased the home and have continued to update and renovate it. The Martins have used an eclectic mix of antiques and other furnishings to make the home very livable, accentuating walls with Mrs. Martin’s own artwork as well as art gathered from their travels abroad. The Corrys are just the second family to own this 1850's farmhouse which boasts a Confederate cemetery in its back woods. Many of the original farm buildings are still in use, including the 100 year old barn which houses Marcie's Sunflower Shop. Living and dining rooms were central to family life in the antebellum days and the entire family often slept in what is now the current living room in the winter. But the real indication of elegance was a closet for the "necessary" room. It is worth a climb to the second floor to visit the home's guest bedrooms. The Princess Room offers a "Trip to The Plaza" complete with an Eloise mural. The Blue Room features a hidden escape door often found in houses of this era. A tree well over 200 years old adds a special touch of elegence to the front view of the property. 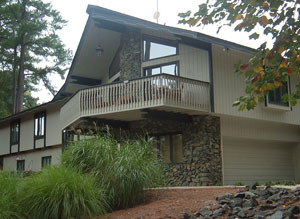 This home was constructed in 1977 and built using Western Cedar. All of the furniture was crafted by Bobby using Rosewood, Mahogany, Walnut, Teak, Carpathian Elm and Zebra wood materials. The den walls and floor were constructed using Teak. All rocks in the construction and around the home were hand laid by Bobby. 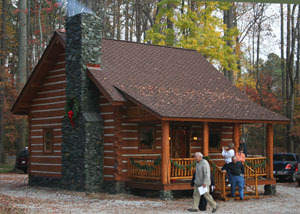 This log cabin was constructed on the Cox property in 2007 using North Carolina white pine logs. Bobby Cox hand crafted all the furniture from Maple and Cedar wood. The floors of the cabin are made from Hickory and the front porch was constructed with Walnut material. The 1914 Union Depot was presented as part of the 2007 home tour. The depot, listed in the National Register of Historic Places, has been preserved as it looked when it served as the town's train depot for rail travelers. The depot was the site of the Apex library in recent years until the library moved to a new location and the building became home for the Apex Chamber of Commerce. The building is open every week for those needing to contact the Chamber of Commerce or just wanting to see the old depot site.